After doing a self experiment, the reason became clear – too many carbs. Now, 1.5 months later, I’ve been in optimal ketosis for weeks. It feels great – way more energy and inspiration, and less hunger. What do I eat to stay in ketosis? Yesterday’s a good example of my ketogenic lifestyle. As usual, I was wide awake by 06:10 am. For once I hadn’t slept well which was annoying, but what can you do. I got dressed, and 15 minutes later I was at the Diet Doctor office. No one else was there. Nice, I would have my ketogenic-morning routine all to myself. A few steps from the entrance, just past a bowl of fruit that I never touch, the caffeine master appeared. 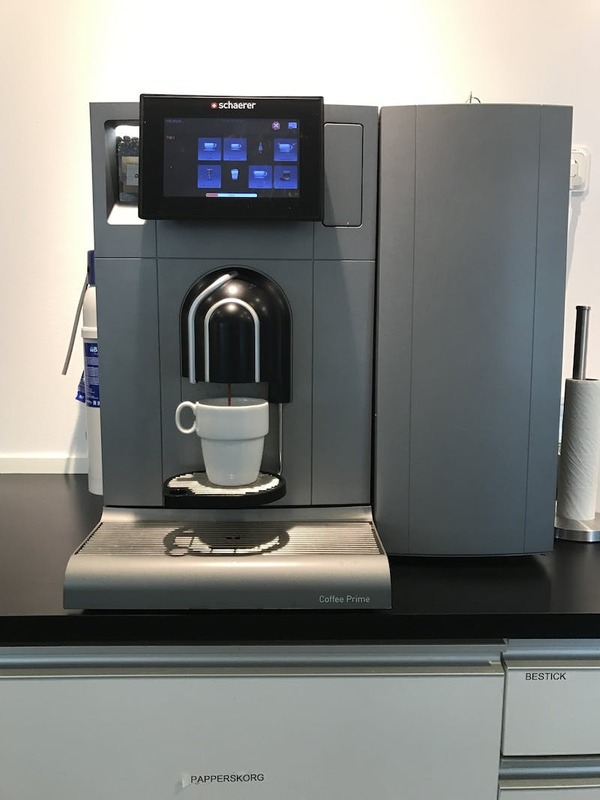 I elegantly grabbed a cup, placed it on the machine, and clicked the coffee button – all while walking. As I entered the Diet Doctor workspace, I could hear the sound of crushing beans. My desk is just by the door so dropping off my bag was quick. Seconds later I returned – the coffee was ready. There’s a fridge right next to the caffeine master. We’ve asked those who manage it to not just buy crappy skim milk, but cream as well. I wasn’t disappointed – a 0.5 liter bottle of heavy whipping cream (40% fat) was there. I poured a healthy dose in (about 50 grams). “Ahhh!”, I said loudly as I took the first sip. The day could begin. Until 5:30 pm, the only thing I ate was that coffee, water, another coffee with cream, and a macchiato at the airport (it has very little milk). 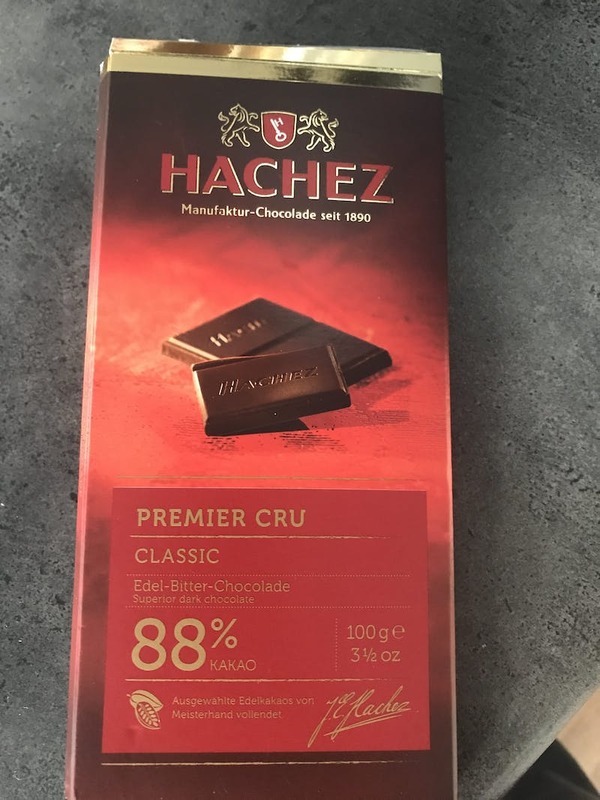 Then, just before I started cooking, it was chocolate time. For dinner, I made chicken liver with a little onion, some spinach, and lots of bacon, butter and sour cream. I added salt and pepper, and boiled a little broccoli as a side (about 100 grams). Delicious. In the evening, I had about 150 grams of cheese, followed by raspberries with cream (around 10 and 100 grams respectively). 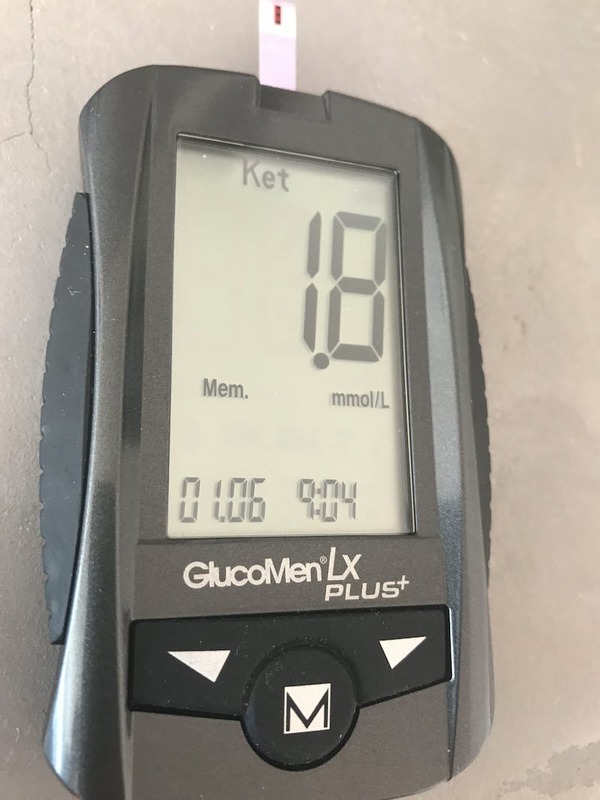 1,8 mmol/L – optimal ketosis. What do you eat in ketosis? Feel free to share in the comments below. Isn't this too little veggies? If a chocolate bar has a minimal amount of sugar as the one eaten in the article, it doesn't kick you out of ketosis? I thought sugar in foods would kick a person out of ketosis, even a small amount.? I find myself moving toward zero carb (basically, you just eat meat). I still eat vegetables now, though, just not many of them. You can eat sugar as long as it's a small amount. I find you have to shoot for zero carbs. I can have some olives, some (full fat or double cream) yogurt, some vegetables, but try to have multiple ones of these, and it's not possible. And my wife makes meat with sauces. Sometimes the sauces are made with onions and tomatoes. I can have small amounts of those, but any more than that, and I'm out of ketosis (especially combined with ANY other carbs). Low carb is one thing, but ketosis is a different level. Thus, I find myself going into and out of ketosis. I try to stay in, but minor amounts of carbs kick me out. Some days, I'm stunned when I get kicked out -- I can't determine why. Also, I only get high values of ketones if I fast for many days (at least 4) or if I eat mainly fat. If I eat protein, I don't get the high levels of ketones. I personally don't find ketones to cause a smaller appetite or better moods or give me more energy. I find exogenous ketones to do that, but endogenous ketones do not. I'll give you an example. I started the day with ketones of 0.4. I did not eat until about 2pm/1400. I ate beef heart and steak. That's it. No vegetables, a zero carb meal. I got home at 7pm/1900 and checked my ketones. You might expect them to go up. They were 0.3. That's right, they stayed the same or went down (I don't know how accurate these are). And this is by no means unusual. I can start at night with ketones of 1.0, while fasting, and wake up with ketones of 0.4. That's normal for me, although I can fast and have ketones go up over night. The other issue is that measuring blood ketones is expensive, around $3 US dollars/test. If you want to measure your ketones twice a day for 7 days, that's $42, $160+/month. So, I try to measure infrequently, but if you measure infrequently, you're most likely out of ketosis, since any carbs = no ketosis. A few grams of carbs (even from sugar) will not kick most people out from ketosis. How about the bloodsugar? Any numbers on that, please? this does not sound healthy at all. You are crazy. coffee during the day and then some chocolate, cheese and livers. where are your veggies? what about water? I agree with Ags -- this daily regimen needs more color from micronutrients! I realize that vegetables, and particularly fruits, have carbs -- but those are what provide our bodies with the tools to be healthy! highest mmols I have had is .9 .Today 0.0 mmol. I do have bullet proof coffees decaf though.But I fear that I may be having too much protein although I am using your plans.. Is it physically possible to increase fats and reduce protein.. If so which meals would you consider to be the highest fat ? When you are burning ketones efficiently, there won't be as many floating around in the bloodstream, thus your numbers will be lower. Thanks for this. There are days when I just couldn't be bothered and it's easier to cook up some meat and nuts to fill the gap. I told myself that I eat veg other days so it all works out, yet there's still always that niggling old worry that I haven't got the daily recommended. However I'm leaner and healthier than I've ever been. I guess it's not for everyone, but it works for me. What's the effect on your microbiome in the lower gut, as far as l can see roughage is required along with fermented products along with periods of fasting along with a variety of different foods( these can be micro servings, equivalent to a teaspoon approx every three days so don't be worried by the amount of sugars or carbs) to maximise the variety of organisms that will survive. Agreed with Lois, Paul and Ags above - a Keto diet focusing on coffee, chocolate and meat/fat with no vegetables is a recipe for disaster for our gut microbiome. As a crash diet perhaps but as a long-term healthy way of eating I'd much rather have a modified Paleo diet. This seems like a fad diet for fast-living businessmen and entrepreneurs. Wouldn't touch it with a barge-pole. Noting that Bjarte included broccoli, onions, and raspberries, as well as plenty of coffee, also a veg, that day. We don’t need to eat tons of vegetables for good health. ’Five-a-day’ is another industrial food lobby myth not supported by science. I"ve been eating Keto now for almost two years , my weight went from 73 kilos to 58 kgs then it started to creep up. I have done Intermittant Fasting, 16/8 or 18/6, and I haven't changed anything, but I'm steadily putting on weight and now I'm 66kgs. I shouldn't be, as I have a Herniated Disc and the Doctor told me to lose weight . I should be "feather Weight." I've been following Diet Doctor for some time and subscribed too.Now I'm attempting to add more fat and eat less veggies. Putting on weight really upsets me, as my clothes don't fit, and my friends tell me that Low Carb doesn't work. I'm the prime example! You don't mention fat adapted. I'm not on keto, just low carbs went into ketosis then fat adapted have lost 65 pounds since September 2017. Once you become fa your blood ketones are used more efficiently and you show a lower reading Continue to be fat adapted and stay @ 0.09 since January 1, 2018! Another aspect I must have missed is exercise? How does aerobic or extreme high intensity affect ketosis? Are there any posts dedicated to an "optimal" , same thing every day type meal plan? Keeping things super simple helps me, so if there were a group and amount of vegetables I could eat EVERY DAY to know I was getting a full balance of nutrients plus not getting too many carbs, that would be very helpful. I could then put in all the meats, fats, etc on top of it. I don't particularly enjoy the veggies, so just eating what is needed each day would be nice and then just stop worrying about them at all. For the next three days, I ate less than 20 grams of carbs by reducing my vegetable and cream intake, still keeping my protein intake below 60 grams. = 11 grams of digestible carbs. Hi Geraldine, After 2 years I've also started to see a weight increase. So I have decided to go back to the initial 2 week challenge. What I have noticed is that 1) I had carb creep 2) I have started measuring how different foods effect my blood glucose and too much protein seems to spike it 3) Exercising after my evening meal gives me lower morning blood glucose levels. There is no problem to go back to basics. The carb creep is so gradual you don't notice it. Age, perimenopause, menopause, stress, lack of sleep also play a role. Don't beat yourself up, investigate and get back on track with me.